It’s an age-old dilemma and it comes up several times each year. What do you do for that special boss or coworker on their birthday, their company anniversary, their engagement, the birth of their child, or to celebrate the holiday season? Gift-giving occasions are endless – and endlessly challenging. You want to gift the boss with something special, but you don’t want it to be too personal or exorbitant. You don’t want to embarrass the receiver with your largesse, but you don’t want to appear tight-fisted in the eyes of someone you like – or your office peers. You know the person from work. You may have some ideas and knowledge about his personal tastes and interests. But, you are totally unfamiliar with what he already has. You don’t want your dozen golf balls joining another hundred in his garage, the victims of other gift givers who didn’t have a clue. If you are the designated purchaser for a group of people, the above problems multiply, as you have more people to please. Especially for a group gift, spend time soliciting ideas from others in the group. Some may know the person better and good ideas multiply when people brainstorm together. Another approach is to talk with a friend or family member of the person you want to gift. Sworn to secrecy, she might have several ideas sure to please. These are my favorite gifts for your valued work associate. People appreciate gifts that commemorate good times and successes at work. A memory book in which all staff write comments and share high points of the year is an often appreciated gift. 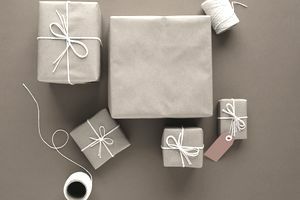 Depending on the individual, scrapbooks with pictures of staff activities, actual company product advertisements from magazines, positive notes from customers, and memory notes from staff make successful gifts. I have even seen an artistic group create a striking collage. Consider a group photograph in an attractive frame for your boss or coworker. You can make the photograph formal or informal, or consider a collage of different staff pictures. (Some of these are group gifts.) A photo album that includes pictures of staff events, product highlights, office happenings, trade show booths, and staff and customer interaction is a particularly winning choice. No matter how close you are to your coworker, chances are you are familiar with some items, hobbies, or food choices that bring her pleasure. A ready-made gift basket filled with selections of her favorite things makes a popular and appreciated gift. Baskets I have seen include an assortment of teas, biscuits, and a teapot for the tea lover and a selection of coffee, jams, and scones for the coffee lover. Ready-made baskets for people who enjoy a particular food such as chocolate or popcorn are also available. Baskets of foods or fruits and other items that celebrate a particular heritage such as Italian or Greek or a particular region such as California or Michigan make popular choices, too. The fun part with baskets is that you can also make one yourself by selecting a theme, then the basket, and filling it with items from various stores. If you have the time, making up your own basket will likely save money. You also have the whole world of stores from which to select the items that fill your basket. You can customize the gift to your coworker's taste. When my uncle worked at Ford, he once received a basket of grapefruit with a grapefruit knife and a set of serrated spoons from his coworkers. As a grapefruit lover, it was a perfect gift for him, a gift that kept on giving; he used the knife and spoons for years. When you are familiar with a person's reading interests, books are an attractive gift choice. The main dilemma I have experienced is identifying a book she doesn't have already. Some people talk about what they are reading or their reading interests, others don't. You face the same dilemma with magazine subscriptions, another possible gift choice. For a reader, select a recent business or people-management best-seller. Or, play it safe and give your colleague a gift certificate to a local or online bookstore. You never go wrong when she can make her own choice. Not as personal as some of the earlier gifts I recommend, a bookstore gift certificate is still a valuable choice. You can always purchase a gift certificate to a popular online or local store. Assuming you select a store your colleague frequents, this is a no-fail gift. Think about your coworker's hobbies and recreational activities as well as her goals and dreams. I'm sure you'll select the right store. Look around your coworker's office. What does she keep on her desk or display in her cubicle? Often you'll find framed certificates of classes taken, awards won, and honors bestowed. Consider purchasing articles engraved with staff signatures, sentiments for the recipient, or an honorary mention of the day or occasion. These may be paperweights or framed prints, plaques or bookends. When you select quality items, these are valued for years. Beyond these ideas for gifts for your boss or coworker, use your imagination. I'm a big fan of desk toys and searched long and hard one year to purchase a variety for a coworker. Take a look at The Office Playground for fun desk toys. Dream on about gift-giving, but remember that a card and a thoughtful verbal exchange are often all that is needed for your boss or coworker to feel recognized and rewarded. To Drink or Not to Drink at Work Events?